Instead of a cold open mocking the Donald Trump administration — breaking what must have been some kind of record streak — the first face we saw was that of country singer Jason Aldean, about to make his first public performance since leaving the stage last Sunday as the shooting rampage in Las Vegas began last Sunday night.Saturday Night Live has always taken great care to strike the right tone after tragedy, and this week's episode managed to delicately address a terrible week on multiple levels, but with a single, thoughtful stroke. 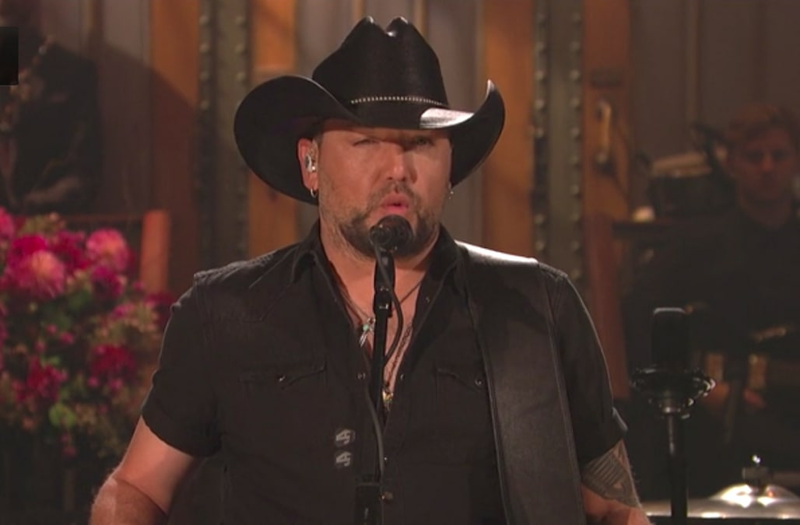 "This week, we witnessed one of the worst tragedies in American history," Aldean said. "Like everyone, I'm struggling to understand what happened that night, and how to pick up the pieces and start to heal. So many people are hurting. There are children, parents, brothers, sisters, friends ... and they are all part of our family. So I want to say to them, we hurt for you and we hurt with you. You can be sure that we're gonna walk through these tough times together, every step of the way. Because when America is at its best, our bond, and our spirit, it's unbreakable." And then Aldean, with his band onstage, launched into "Won't Back Down," the definitive anthem to defiance and one of the biggest hits off of Full Moon Fever, the sensational 1989 album by Tom Petty, who died last week just as everyone was severely smarting from the Vegas massacre. So many layers there, such a fitting tribute. But SNL has always been good at handling these situations — remember when Lorne Michaels asked Rudy Giuliani if they could be funny after the September 11 terror attacks and the then-New York mayor quipped "Why start now?"